Beginning in 1938 with the debut of Superman, the world of comic-books experienced a superhero population explosion, a period called the Golden Age by comic historians. There were hundreds of them, and while the art and story quality varied from comic to comic, the majority were interchangeable, disposable children's fare. 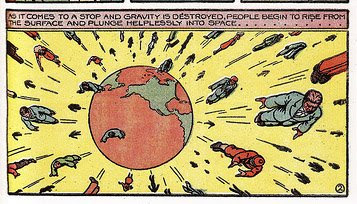 By the time WWII came to an end, interest in the superhero waned considerably. Dr. Frederick Wertham, a frenzied psychologist convinced that comic books were corrupting the children of America, delivered the finishing blow through his book The Seduction of the Innocent. By the fifties, the only notable characters still being published were the big guns like Superman, Batman, and Wonder-Woman. The others weren't so lucky. While some Golden Age superheroes would be resurrected in later decades, for the most part obscurity claimed innovator and imitator alike. Many diamonds in the rough met oblivion with their cruder cousins. One nightmarish gem was Stardust the Super Wizard, created by Fletcher Hanks. 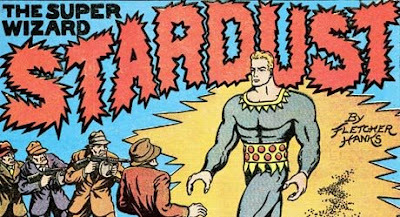 First appearing in 1939's Fantastic Comics #1, Stardust was lost for years until his re-discovery in the early eighties by artists involved in the "underground comics" scene. 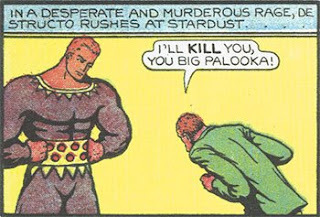 Along with other Fletcher Hanks comics, Stardust had long since passed into public domain, allowing for the Stardust to be reprinted with comparative ease. The comics drew the attention and praise of renowned cartoonists such Jules Feiffer and R. Crumb, as well as novelist Kurt Vonnegut. They were truly unlike anything else. On one level Stardust comics are simply cartoonish. The plots always follow the same formula (bad guy commits crime, hero punishes bad guy); the dialogue is consistently bold and flat. On another level, they're as bizarre and frightening as a fever-dream. Produced in an era rife with superheroes, Stardust stands out as the creation of a vivid, warped imagination. As a character, Stardust is supremely powerful, totally righteous, and completely alien. He was from another planet, and after apparently abolishing crime on several worlds, he earned a reputation so legendary that he was well-known on Earth before his arrival. Even by today's standards, with most superheroes having ascended to casual immortality, Stardust was depicted as a true god from the get-go. His mastery of extraterrestrial science afforded him complete omnipotence. He could monitor the entire planet, travel anywhere instantaneously, and all matter could be molded to his freakish will. In one story, he permanently shrinks an evil scientist to doll size. Subsequently, he decides to merge a group of racketeers into a single man and hurls the confused composite being into outer space (this coming after reducing their leader to a disembodied, screaming head). Comparatively, these guys got off easy. Other foes are rendered immortal and paralyzed on a distant planet of gold, eternally unable to reap the riches they crave. Another is left frozen in interstellar prison, trapped to contemplate his crimes until the end of time. The artwork in these stories is highly eccentric. The villains all have contorted, simian scowls; bulging eyes lurking beneath cavernous brows. Stardust has a tiny head and massive jaw, his expression always one of bemused nobility. Everything is awash with hallucinogenic color. 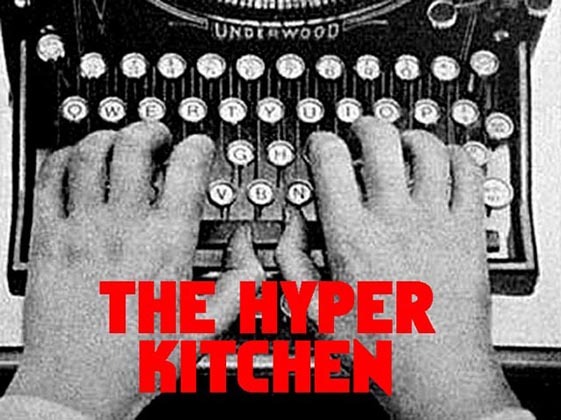 Yet within these loud, bombastic stories are scenes of intricacy and compelling detail. They're somber and hyperactive at the same moment. When the Stardust was originally published, there were no rules to superhero stories and consequently no restraints. Fletcher Hanks apparently sought to make them as wild as possible and the results were startling. Some even went so far as to call the man a genius. One such Hanks fan, artist and writer Paul Karasik, was editing a book of Fletcher Hanks stories. 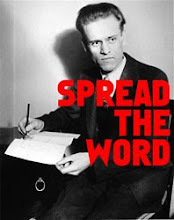 He was determined to track down the obscure creator of Stardust and his investigation led him to Hanks' son, a WWII veteran named Fletcher Jr. A disturbing picture developed, as Fletcher Jr. recalled his father's alcoholism and cruel ways. 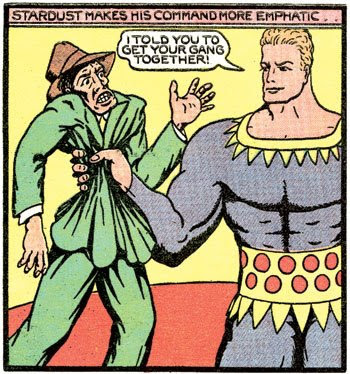 A wife-beater and abusive father, Fletcher Hanks Sr. could be every bit as monstrous as the villains that his creation Stardust fought against. He later abandoned his family, after stealing money his son. He was discovered by police in 1977, frozen to death on a New York City park bench. Super hero comics are largely commercial and innocuous things, but sometimes they gain a strange potency when the stories behind the four-color world emerge. On the surface, Stardust is an oddity. When one considers the violent life of Fletcher Hanks (and what that implies about his artwork) Stardust becomes deeply unsettling. If you're interested in reading Stardust comics, seek out I Shall Destroy All The Civilized Planets, edited by Paul Karasik. It needs to be seen to be believed. For more information and examples of Fletcher Hanks artwork, you can visit his website. Thanks for the kind words about my book. A second volume, "You Shall Die By Your own Evil Creation" will be released this summer. Together the two volumes will comprise the Complete (God help us) Fletcher Hanks. I slide show of a story from Volume II appears on the BONUS page at my website: www.fletcherhanks.com. Prepare to meet your fate, mortal! I bought I Shall Destroy All Civilized Planets two years ago and I was haunted by it. I had heard about the second volume, but I didn't realize that it was coming out so soon. I put a link to fletcherhanks.com on the site. Thanks so much for your comments! I wonder if Stardust might ever get grabbed and made into a movie.Probably unlikely without the built in audience needed to guarantee that profit return.